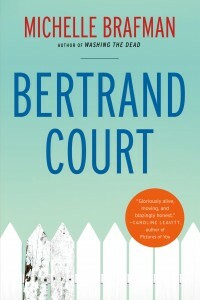 Michelle Brafman is the author most recently of the work of fiction Bertrand Court. She also has written the novel Washing the Dead, and her work has appeared in a variety of publications, including The Washington Post and Tablet. She teaches at the Johns Hopkins University MA in Writing Program, and she lives in Glen Echo, Maryland. Q: You note that you wrote Bertrand Court over a 15-year period. Did you plan to write a series of linked chapters from the beginning, or did that idea develop as you wrote them? A: I wrote a slew of random stories, and then I read Amy Bloom’s short story collection, Come To Me, and she gave me the idea to write linked pieces. Her individual stories felt complete, but then she cracked them open by writing subsequent tales that explored the characters from different perspectives and/or time periods. I loved that and grew more curious about my own characters. Who were they when they were pushed to their emotional brink? When they were standing on firm ground? How were they perceived by their family members, friends, or enemies? So the same character who in one story steals the family silver, emerges as the family matriarch in another, or the rock solid dental hygienist, the glue of Bertrand Court, steals a leather jacket from Nordstrom after her husband’s business goes bankrupt. I can be quick to judge others and myself, and writing these stories taught me to take a step back and embrace the complexities and inconsistencies that make us all so frustrating, lovable, disappointing, funny, and ultimately, human. Q: Did you write the chapters in the order in which they appear in the book? A: No, but I did write in triptychs, groupings of three linked stories, which I later tied together. Q: Would you describe the book as a novel or as linked short stories, and why? A: It's most accurate to describe Bertrand Court as a collection of linked stories, but it definitely has an arc, which is expressed via life’s passages. The book opens with a story narrated by a fetus and proceeds to explore: a couple’s burning desire to conceive, a disastrous bris, a kindergartner’s birthday party mishap, a fading politico’s midlife torpidity, and an heiress’s desperate search for meaning. In the final chapter, on the eve of his 50th birthday, an upstanding father and husband subconsciously risks his marriage because he is terrified of his mortality and wants to destroy his life’s blessings on his own terms. Q: What's been the reaction to the book so far? A: People tell me that they binge-read the stories/chapters as they would watch episodes of a Netflix series. Much to my delight, readers seem to relate to the characters and their situations. "I know that guy. He's my neighbor, boss, ex-husband . . .or that happened to me…,” they'll say, which is music to my ears. Q: Do you feel especially connected to some of your characters, and if so, why? A: I hope this isn't a cop out, but I feel connected to all of my characters. Some infuriate me, and others are more endearing, but I love them all or I couldn't write about them. 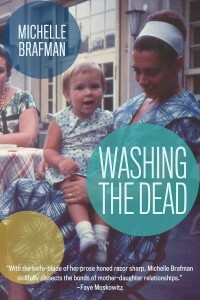 Q: In our previous Q&A about Washing the Dead, we discussed the role of religion in that novel. How would you describe the role of religion in Bertrand Court? A: Many of the characters in Bertrand Court are Jews; others are not. I was interested in exploring a variety of interfaith relationships from multiple perspectives, specifically the intersection between these characters’ emotional and spiritual relationships. For example, in “Skin,” when the protagonist’s son’s bris goes bad, he must untangle his feelings about his relationships with his father, his Gentile wife, and his faith. The stories about early pregnancy loss are also filtered through a Jewish lens. A sterling silver baby spoon smuggled from “the old country” features prominently in a series of stories about the superstitions and jealousies that attach themselves to a family’s multi-generational struggle with early pregnancy loss. I’ve always been interested in people’s spiritual lives, perhaps because there’s a mystery to them. Religion is not a topic that emerges during conversations with my family members or closest friends. I want to understand my characters’ relationships to their faith and to God, and explore ruptures in their souls, and how they recover from them. A: I’m working on a new novel, but I’m hesitant to talk about it too much. The more I talk, the less I write! A: I’d like to mention a little something about the setting, specifically my desire to show a side of D.C. not often found in fiction or on television. My characters work for the people who work for Scandal’s Olivia Pope or House of Cards’ Congressman Underwood. They Metro in from the ‘burbs to Capitol Hill, drive carpools, and slide into consulting jobs if their candidates lose. They’re cameramen, audio technicians, and editors who gather and package the soundbites we see on the nightly news, and they suit up and caffeinate when assigned to cover an election or political scandal. So while the book is set in D.C., I’m hearing that it has wider appeal. That makes me very happy because I wanted to leverage this larger awareness and hunger for power and status to explore the delicate power balances that exist within the marriages, friendships, and more casual relationships presented in these 17 narratives. --Interview with Deborah Kalb. A previous version of this Q&A appeared here. 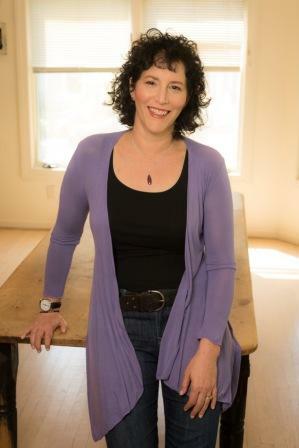 Michelle Brafman will be appearing at the Bethesda Literary Festival on April 22, 2017.